YOUR SKIN IS THE MOST IMPORTANT ASPECT IN DETERMINING YOUR LOOK. 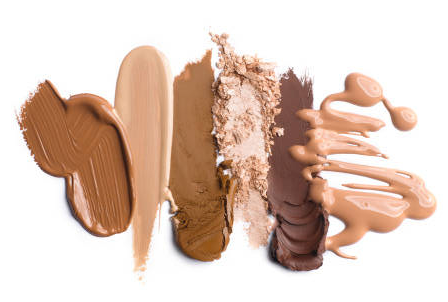 SELECTING THE RIGHT SHADE AND CONSISTENCY OF FOUNDATION IS YOUR ABSOLUTE STARTING POINT FOR SUCCESS.HERE IS A BRIEF DESCRIPTION OF THE DIFFERENT TYPES OF FORMULATIONS AND WHAT BENEFITS THEY OFFER. LIQUID- GREAT FOR ALL SKIN TYPES, SPECIALLY THE OIL FREE FORMULAS FOR PROBLEM SKIN. LIQUID ALSO COMES IN AN OIL VARIETY FOR DRY SKINS. STICK- IT IS REALLY THE SAME AS CRÈME, OFTEN IT COVERS MORE BUT IT CAN BE OILY. POWDER- GREAT FOR EVENING OUT, GREAT ON GOOD SKIN, TAKES THE SHINE OFF. CRÈME TO POWDER- EVENS OUT SKIN AND GIVES A MATTE FINISH. BB FOUNDATIONS OR BEAUTY BALM – A GREAT MULTI-TASKER WITH PRIMER, MOISTURIZER AND SPF ALL IN ONE. AIR CUSHION MAKEUP – A LIQUID FOUNDATION THAT IS SOAKED IN A SPONGE TOGETHER WITH SPF, MAKEUP BASE AND MOISTURIZERS. CHECK IT OUT !! HERE ARE SOME SIMPLE STEP BY STEP APPLICATION TECHNIQUES AND TRICKS. TEN STEPS TO A FLAWLESS FACE. IN THE MORNING USE A LIGHT MOISTURIZER FOLLOWED BY A SUNBLOCK THEN PRIMER AND FINALLY FOUNDATION . CHOOSE A MOISTURIZER OR SUN BLOCK THAT ISN’T OILY. AT NIGHT, YOU SHOULD YOU ALWAYS START BY EXFOLIATING/WASHING AND MOISTURIZING. LOOK AT YOUR FACE AND TRY AND DECIDE WHAT IT NEEDS. CIRCLES AROUND EYES, OR NOSE CHEEK IMPERFECTIONS, ETC. EXFOLIATE AND NOURISH AT NIGHT. IN THE MORNING, USE A SIMPLE LIGHT MOISTURIZER, NOT TOO OILY. IF YOU HAVE TIME TO LET IT ABSORB INTO YOUR SKIN IT’S BETTER. THEN APPLY FOUNDATION. TARGET THOSE SPOTS FIRST BY USING A DOT OF FOUNDATION AND BLEND. IF YOU ARE GOING TO PUT FOUNDATION ALL OVER YOUR FACE, COVER THE BLEMISHES OR DARK CIRCLES LAST WITH EXTRA FOUNDATION, OR CONCEALER. I LIKE TO FOCUS FOUNDATION ON THE “T” ZONE, EYE LIDS BETWEEN EYEBROWS, LIP TO FOREHEAD, NOSE MOUTH TO CHIN AND BLEND OUT WITH VERY LITTLE ON THE REST OF THE FACE. TO FIND THE CORRECT FOUNDATION COLOR FOR YOU, TRY BLENDING A DOT OF THE FOUNDATION THAT YOU WISH TO USE ON YOUR JAWLINE. IF IT MATCHES YOUR SKIN COLOR THAT’S THE ONE TO USE. FOR SPECIAL EVENTS, PUT A LITTLE FOUNDATION ON THE BACKS OF YOUR HANDS. THEY WILL LOOK GREAT. VERY IMPORTANT, USE TRANSLUCENT POWDER EITHER LOOSE OR COMPACT NEXT. IF YOUR FOUNDATION NEEDS SETTING OR MATTIYFING USE POWDER SPARINGLY, BLEND WELL AND BUFF. IT SETS AND FIXES THE FOUNDATION AND GIVES A NON-SHINY LOOK. PUT ON POWDER EYESHADOWS- POWDER BLUSH ETC. IT GIVES A SOFTER BLENDED LOOK. FIND THE TOOL THAT WORKS BEST FOR YOU WHETHER IT BE YOUR FINGERS, SPONGE OR A BRUSH. THE TRICK TO GETTING THE RIGHT COLOR MATCH FOR YOUR FOUNDATION IS TO TEST IT BY BLENDING A SMALL PATCH OF IT ON THE JAW LINE, THAT WAY YOU CAN SEE IF IT MATCHES YOUR NECK AND UP INTO YOUR FACE.